Having healthy feet has the potential to improve how your entire body moves, but most of us hide our feet in shoes where they’re out of sight and out of mind. You’re probably familiar with the way your car works: Tires contact the ground, translating the force up through the wheels and transmission to propel the car forward. You know that the condition of your tires determines how your car feels on the road and worn out tires can’t absorb the impact of a bumpy or grip on icy roads. Our feet work similarly for us, and the condition of our feet determines how well they serve our body. Foot pain, unsteady ankles and conditions like plantar fasciitis or neuromas are signs of a problem, but there are more subtle signs that your feet need attention. Some indicators that your feet may be starting to weaken are loss of balance, tripping easily or often or losing your ground. Hard-to-ignore symptoms may vary from swelling and bunions to hammertoes, calluses and corns. Pain in your knees, ankles, hips and low back may also relate to declining function way down in the foot. Maybe you are comfortable in heels, but going barefoot is killing you. Maybe you often get cold feet, literally. Many factors cause our feet to lose their nature-given ninja status. For one, our shoes constrict the foot and its movable parts; shoes also reduce sensation and deprive us of direct contact with the ground. We also lack natural, untamed by man, walking spaces — in a natural environment your foot would be molding to pebbles, rocks, grass, boulders and inclines. Most of us live with feet only touching flat and solid ground, so it’s no wonder we lack mobility and strength — those attributes simply aren’t required anymore. Also known as hallux valgus, this deformity appears as we lose the strength in our core, hips and feet, and the whole body weighs onto the inside of the ball of the foot with every step you take. The four smaller toes of the foot sometimes get stuck curled up and under. That often starts as the toes are being crammed into too small or narrow a shoe or sock or by the muscular action of grabbing onto a flip-flop. These show up when your shoes rub against your skin, creating pressure and friction. The body responds by laying down extra skin, but then the raised surface itself becomes another place to press and rub against. Remember how spread out the Flintstones’ feet were? Your toes are naturally supposed to have space between them. That allows the metatarsals to meet the phalanges in good alignment, ensuring pain-free and smooth transition over joints of the foot. You don’t need high arches to have functional feet, but if the whole foot contacts the ground and you have some aches and pains, you may need to look deeper. People with rigid and high arches usually tend to hang out on the outside of the foot and have a hard time creating stability through the front of the foot. 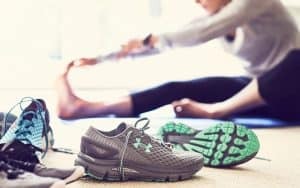 There are many simple exercises you can do anytime throughout your day to improve your foot shape and strength, but let’s get started with these three for healthy feet. Grab a towel, roll it up to the thickness of a wine bottle and put it in front of you. Space your feet hip-width apart. Step forward, and place one foot at the edge of the towel, keeping the foot straight. Walk forward with the other foot until you feel a stretch in the calf of the front foot. Keep the pelvis from rotating, and do not bend at the waist. Keep weight in the heel of the stretching leg and both legs straight. You can step forward or back to adjust the amount of stretch. Hold for 1 minute on each side, and repeat several times. You can give your toes a great stretch by interlacing your fingers and toes for a “foot shake.” Simply thread your fingers between your toes and hold for a while. TV time is a great time to stretch those toes. Use a tennis ball to massage your feet daily. Place it directly under your foot, and roll back and forth, focusing on releasing tighter, stickier spots. Don’t use too much weight. It should feel good. Keep in mind that it takes time to recover your foot health after years of stuffing them in shoes and walking on manufactured and manicured ground. Ultimately, your shoes need to change as much as your feet, but giving your feet some tender loving care is a great start.